RBTH presents a selection of views from leading Russian media on international events, featuring reports on the visit of U.S. Assistant Secretary of State Victoria Nuland to Moscow, the warming of relations between India and China, and the death sentence handed down to ousted Egyptian president Mohamed Morsi. 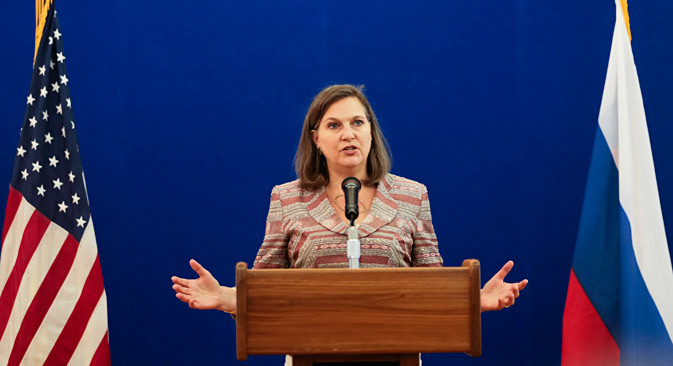 The tabloid daily Moskovsky Komsomolets reports that U.S. Assistant Secretary of State Victoria Nuland is visiting Moscow. She is planning to discuss further steps in the implementation of the Minsk accords as well as bilateral relations between Russia and the U.S. The paper recalls that earlier U.S. President Barack Obama announced that he intends to veto a House of Representatives bill which envisages the allocation of funds for the supply of lethal weapons to Ukraine. Ukrainian pundit Rostislav Ishchenko told Moskovsky Komsomolets that the ban that Obama plans to impose can be easily overcome by the Senate. “With his veto, the U.S. president wants to show to Putin that he is capable of negotiation, but this will have absolutely no bearing on the final outcome. The bill on arms supplies to Ukraine will come into force no matter what,” said Ishchenko. For his part, the head of the CIS Institute, Konstantin Zatulin, told Moskovsky Komsomolets that the ban on arms supplies to Ukraine that Obama intends to impose shows that the United States had taken note of the Victory Day parade and all that happened in Moscow on May 9. “The fact that Russia and China are growing closer together is causing much concern in the U.S. At this stage, they think it expedient to reduce the degree of tensions in Russian-U.S. relations in the hope that it could slow down the Russian-Chinese rapprochement,” said Zatulin. The Kommersant business daily reviews Indian Prime Minister Narendra Modi’s visit to China, which has marked a rapprochement of sorts between the two Asian powers. The Indian leader held talks with the senior Chinese leadership, including President Xi Jinping and Premier Li Keqiang. The paper points out that Xi Jinping received Modi in his native province of Shaanxi, which the Indian delegation interpreted as an important gesture since it was the first time the Chinese leader had received foreign visitors in his hometown. Kommersant reports that the talks focused on the unresolved territorial dispute between the two countries, the result of the Indian-Chinese war of 1962, in which Delhi suffered a defeat. If this dispute is resolved, it would give a major impetus to resolving the more fundamental geopolitical disagreements between the two rivals for leadership in the region, the paper adds. The growing rapprochement between the two Asian giants is likely to add further weight to the arguments of those politicians in Moscow who are seeking to create a Russia – India – China triangle. Until recently, the emergence of this geopolitical alliance has been hindered by the existing disagreements between Beijing and Delhi, Kommersant concludes. The centrist newspaper Nezavisimaya Gazeta reports that a court in Cairo has provisionally sentenced Egypt’s ousted president Mohamed Morsi to death. Morsi was standing trial on charges of a conspiracy with foreign militants aimed at organizing a mass prison break during the events of the Arab Spring in January 2011. The sentence is provisional and is yet to be confirmed by the country’s supreme mufti on June 2, the paper explains. The execution is likely to be postponed as it could spark new unrest in the country and provoke an extremely negative reaction from Turkey, the U.S. and several other countries, Nezavisimaya Gazeta adds. “If the sentence is carried out, it would cause mass protests among Morsi’s supporters. The situation in Egypt is relatively stable at the moment and unhinging it is not in the interests of the ruling Egyptian elite,” senior research associate with the Institute of Oriental Studies under the Russian Academy of Sciences, Vladimir Sotnikov, told Nezavisimaya Gazeta. Therefore, he concluded, the execution of the sentence will most likely be postponed.